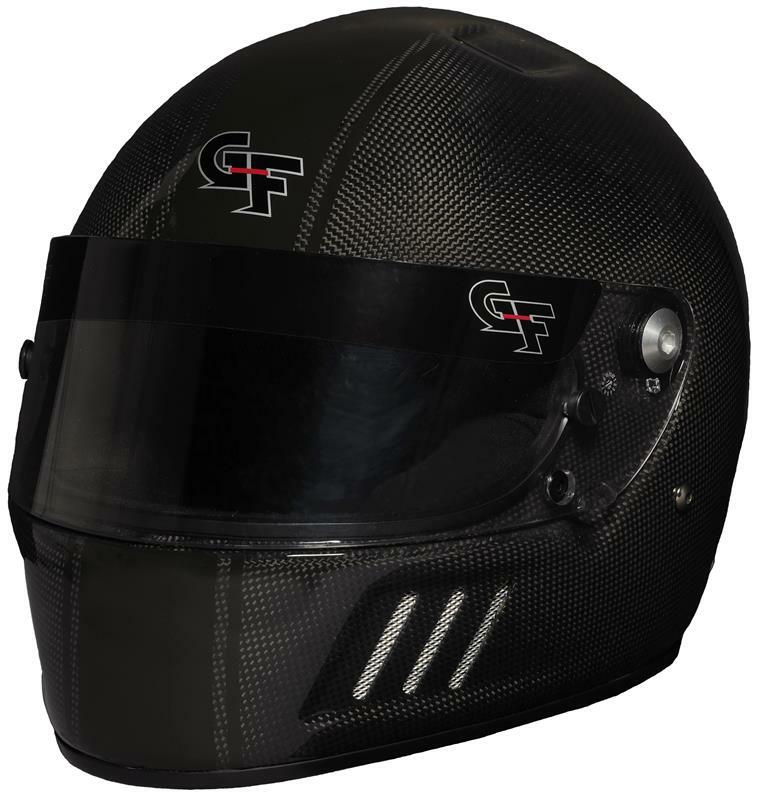 G-FORCE Helmet - CF3 Full Face Carbon Fiber UNIVERSAL - Dezod Motorsports Inc - Home of the automotive performance enthusiast since 2002. A new take on the previous design from G-FORCE Racing Gear, the CF3 is the new standard in functionality and style. From the outside in you will notice the difference. The outer contact shell is made with a ultra-lightweight, Carbon Fiber and composite blend which weighs 15-20% less than standard models. The shell is then coated with deep, rich protective clear coat outer layer. The rear of the helmet is accented with double ridge lines that add both style and strength to the CF3 shell. Reinforced mounting points for Helmet Restraint Systems are built into the shell during production for added durability. The G-FLOW Ventilation System siphons air into the 6 slotted chin bar ports, around the interior and siphons out the 2 top and 2 rear vents to aid in cooling. An optically correct, .125” thick, ProFit Shield encloses the extra wide eye port opening and secures to the rubberized, eye port gasket to keep dust and dirt out. The ProFit Shield is held in place by two aircraft aluminum, wide-head bolts for easy change-out and removal. The thumb indention makes lifting the shield, even with gloves, simple and clean. The pivot kit contains 5 shield ratchet positions so that the driver can adjust to their liking. The front of the helmet is completed with a smooth-slope, auto racing chin bar which is different than a motorcycle, sharp-nosed design. On the inside, G-FORCE Racing Gear has produced the most user friendly, comfortable helmet on the market. The heart of the CF3 helmet is the, multiple density, ConeHead impact liner made to react to differing impact situations. The impact liner is covered by a soft knit, hypoallergenic, padded CoolTec, flame retardant liner for comfort and fit. A SpecFit Channel has been added to secure placement in the use of seeing or sunglasses. The chin strap in the CF3 helmet is bolted to the shell with stainless hex-head bolts and is made from durable, flame retardant para-aramid webbing. The CF3 helmet carries the Snell SA2015 rating and at an average of 48 ounces, this is the lightest helmet in the GFORCE line. The G-FORCE Racing Gear CF3 is the professional racer’s choice for a clean look with unmatched quality and feel.